ST. LOUIS — David Perron had no idea what would happen when he became a free agent this summer. Then he got a familiar call. The 30-year-old Perron is beginning his third stint with his first NHL team after signing a four-year, $16 million deal with the Blues. When it came time to pick a new home this summer, the veteran winger opted for an old one. 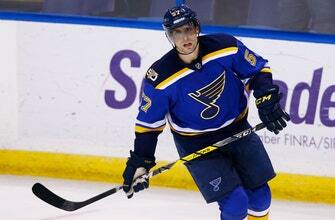 Perron and his wife, Vanessa, have two kids: Mason, 3, and Victoria, 1. Mason just started preschool. Victoria was born in St. Louis. Following stints with the Oilers, Pittsburgh and Anaheim, he returned to St. Louis when he agreed to a two-year, $7.5 million contract in 2016. But the Blues left him unprotected for the expansion draft last June and the Golden Knights pounced.